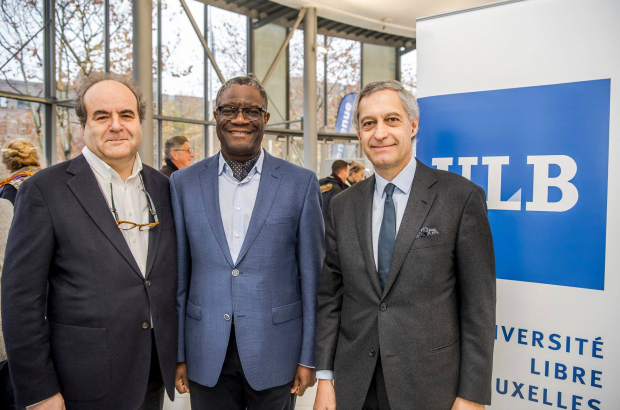 Nobel peace co-prizewinner Dr Denis Mukwege made a special address to Brussels Free University (ULB) medical students on Monday. Founder of the Panzi hospital in eastern DRC, the gynaecologist and ULB tutor’s message to students was to combat against sexual violence and in particular fight for gender equality. Dr Mukwege was in Brussels before heading to Oslo, where he will receive in December the Nobel Peace Prize with co-winner Nadia Murad. Both human rights campaigners have been recognised for their work helping victims of gender violence. The lecture followed a ceremony honouring the surgeon and attributing his name to the auditorium at the Erasme campus in Anderlecht.